Seda Mavyan (SM) is a Nouvelles d’Arménie Magazine correspondent in Armenia. Nouvelles d’Arménie is a monthly magazine published in Paris in French. She had a meeting with Ruben Hayrapetyan (RH) on August 11, 2012 near a public swimming next to the Avan Soccer Academy and behind Harsnakar hotel-restaurant, where the tragedy of June 17 took place. The interview was four hours long, most of which was recorded. The French translation of a part of this interview was published in the most recent issue of Nouvelles d’Arménie (#188, September 2012). Taking account of the exclusivity of the interview, Nouvelles d’Arménie decided to transcribe it in Armenian and publish the full version on its website for Armenian-speaking and, particularly, Armenia-based readers, giving the Armenian news outlets permission to republish any fragment of this interview, to ensure wide public response. Besides, SM hopes the readers’ responses to this publication will help make additions or corrections to RH’s biography as we know it. She also hopes to contribute to the coverage of certain particularities regarding Vahe Avetyan’s murder case. SM: Let’s start from the very beginning. What environment were you born and raised in? RH: I was born to a well-off family. In Soviet years, starting from 1970s, my father supervised two restaurants. One was at the end of Acharyan Street – it used to be a very good restaurant, one of Yerevan’s best – and the other was in Nork, next to the hospital. It was called Grill bar. My father had built them from scratch and was their director. SM: How did your father obtain means to build those two restaurants? RH: I was seven years old in 1970. You should ask him. I know that before 1970 my father was in trucking business, which was quite profitable back then. They were exporting foods and stones in big vehicles from Armenia. My mother did not work. She was a housewife. SM: Where do your family roots go back to? RH: We are from Avan. A part of the Avan people has moved here from Khoy, Iran. I tried to do some research, but was unable to find out whether my father’s family was local or had immigrated from Khoy. At any rate, the people of Avan speak the Khoy dialect. My mother is from Akunk village near the town of Abovyan. SM: How did your nickname, Nemets Rubo, originate? Your father is rumored to have been taken prisoner by the Germans. RH: Absolutely not. My father was born in 1939. How could he have been taken prisoner by the Germans? He was six years old by the end of the World War II. We inherited that nickname from his uncle, my grandmother’s brother, my grand-uncle, who was conscripted to the army, participated in the war and got wounded. Shell fragments were left in his body. He was a driver by profession and, as any driver, fixed cars, too. When fixing a truck, he would crawl under the vehicle, causing the shrapnel inside his body to stir, which hurt. And he would start cursing the Germans, like, ‘nemets’ this and ‘nemets’ that (Translator’s Note (TN): Nemets means German in Russian). And people started calling him ‘Nemets’ and then the nickname passed on to us. SM: Did you go to Armenian or Russian school? RH: An Armenian school in Avan. SM: Have you been a Komsomol member? RH: Yes, unfortunately. (Laughs). We were becoming Komsomol members upon turning 15. Had I refused, they would go after my father; they might even exile him to Siberia. And if I chose to quit the Komsomol after school, you should know that they would not let my Dad have even a morsel of bread. SM: You have worked at Almast factory as a laborer from 1980-1981 (at the age of 17-18). How did that happen? RH: In Soviet times, if someone was not admitted to a university, had the option of working as a laborer for a year and get work experience, and then take the entrance exams again. SM: Why did you fail to be admitted to a university? RH: The Soviet system was applying a very artificial principle: you had to wait for your turn for everything. You had to wait in line to buy bread at a store, wait in line to buy meat, beat the competition to be admitted to the university. There were 500 applicants for 25 spots, that is to say, 20 applicants per spot. I was only three points shy of success. And the work experience as a laborer not only gave you an opportunity only to participate in the exams again, but also granted extra points. SM: What kind of a job were you doing at the factory? RH: I was a first class electrician at Almast factory located in Zeytun District of Yerevan, where I was producing saws. I would take the broken mechanical parts, especially the failed large engines, to a master, who would repair them. I was admitted the next year. SM: That is to say, you have a university degree. SM: How long have you studied and where? RH: I was admitted to the Yerevan Institute of People’s Economy, but then a new law was adopted, according to which everyone had to join the army after the second year of study. I had to interrupt my studies in 1983 in order to serve in the Soviet army in Stepanavan. SM: So, you stayed in Armenia, whereas many conscripts were sent to remote locations throughout the Soviet Union. Did it happen by chance or you had done something for that? RH: It was by chance. RH: I returned from the army in 1985 and continued my studies, graduating from the university as an accountant in 1988, at the age of 25. After that I was appointed an accountant at the Public Food Union. Each region had its own Public Food Union, it included over 200 enterprises related to food, that is, restaurants, canteens and so on. I worked there at the main headquarters. SM: And didn’t you want to manage your father’s restaurants. RH: In Soviet times, it was up to the state to decide who works where after graduating from a university. We had no choice. We were obliged to work in accordance to the permit for three years. Only after that was one allowed to change one’s workplace. They could as well send you to some village, and if you dared to decline, you would get into a lot of trouble. Therefore it was better to accept the unpleasant work, which you were offered to accept for three years, than decline it. In order for you to be able to make up your mind where you wanted to work after the university, you had to know some high officials and have the so-called free-ride diploma. SM: Were taking account of your profession when they were making the first appointment. RH: Definitely. Moreover, in order to employ people in accordance with their professions, they would often enlarge the staff beyond necessity and, as a result, a small store could have three directors. On top of that, there was the obligation to work. It was impossible not to work. Once left without work, one would get the first warning. Then that person would be appointed to work somewhere. And if that person refused to work, he would be tried and sentenced to a year in jail. SM: We are getting close to 1991, the eve of Armenia’s independence. You are 28 years old. Vazgen Manukyan, then the Prime Minister, appoints you to the position of Deputy Director of Haytskhakhot, which produced Armenian cigarettes. Where did you know him from? SM: Does that mean you have participated in the Movement? RH: In every way. I helped in every possible way. But I don’t like to talk about that. I don’t like to talk about my good deeds or my charitable acts. But I can at least say that I have taken an active part in all the initiatives, which could contribute to the fall of the Soviet system and that the Karabakh issue was very important for me. And that is what drew me to participate in the Movement. I wanted Karabakh to be ours and I wanted independence. That is why I was helping the leaders of the Movement with everything: weapons, arms supply, money and food. When the movement started I was not only a Public Food Union accountant but also took care of my father’s restaurant in Nork. We prepared food for the participants of the sitting strike at the Opera House. SM: That is to say, you knew the members of the Karabakh Committee from the very beginning. RH: Yes, Vache Sarukhanyan and Igor Muradyan were the first, although the real founder of the Karabakh Committee was Vazgen Manukyan who had started the anti-Soviet initiative back in 1965-1967. To be even more precise it was Gagik Safaryan who opened the first demonstration. Safaryan and I are from the same neighborhood. But it lasted only10 days, because the leaders at the initial stage were politically immature. Then Vazgen Manukyan accepted the leadership of the movement. I was present in the making of the Movement from the very beginning. I personally knew every member of the Karabakh Committee, was close with them, because I had responded to their calls to contribute funds and supply food to the demonstrators. You know, it was not like today, when they can organize riots like hooligans and destroy everything. Back then something had awakened in people’s hearts. I was shocked with happiness. When the Karabakh Committee called on making donations, money was collected in big sacks at the Opera square. People would bring their salary to the square and drop it in those sacks. That’s how it began. Then it was necessary to supply bullets. Maybe I don’t have a right to speak about it, but we were buying bullets from the Soviet army. SM: You were bribing the commanders and the officers of the Soviet army deployed in Armenia? RH: Of course, naturally. After that I personally participated in the liberation war of Karabakh. SM: Are you saying that you fought in Karabakh? SM: Could you say in which detachment? RH: In different detachments. I don’t want to talk about that. SM: Have you participated in the liberation of Shushi? SM: Have you participated in the loss of Martakert, Shahumyan, Getashen? RH: No, I was not there. SM: Then where were you? RH: I already told you that I don’t like to talk about it. I was buying weapons in Akhalkalaki. Since I worked at Haytskhakhot, I would take cigarettes to Akhalkalaki and exchange it for weapons and arms supply. SM: And were you politicized at that time. RH: One day, if we get a chance… But I have had enough of us talking about myself. SM: Could you at least say whether you were a member of any political movement? RH: I have neither been a Dashnak or Hnchak. I was simply with my country and the people. It is true that the influence of Dashnaktsutyun was at some point dominating, because the Dashnaks were able to supply their detachments with weapons, food, uniforms from abroad. SM: Before closing this subject, which deserves a separate interview, do you insist that you did fight in Karabakh? RH: Yes, I fought under Smbat Hakobyan. He can confirm it. SM: Are you a member of Yerkrapah? SM: Let’s return to Haytskhakhot factory, where you were appointed Deputy Director by Vazgen Manukyan in 1991. Who was the Director? RH: Lida Sargsyan. She had been the Director of that factory since Soviet times, since 1985, if I am not mistaken. SM: Why did Vazgen Manukyan appoint you to that position in 1991? RH: The country was in chaos. The Soviet Union was falling apart, and mass plundering was underway. There were armed groups, which would invade state-owned enterprises and take away whatever they liked. In fact, they appointed me so that I prevented the factory from being pillaged and restored order, which I did. SM: In 1993 you become Chief Engineer of Haytskhakhot. What did this appointment mean? RH: Haytskhakhot was not a factory. It was a union, which included four tobacco processing factories in Tavush, Sevan, Goris and Yerevan, and the main headquarters was in Yerevan. Being a Chief Engineer meant being the second person after the Director in the Association. SM: In 1994, Haytskhakhot was privatized under Levon Ter-Petrosyan, and you become a shareholder. Was it from then on that you started getting rich, after buying the factory for a song? RH: I haven’t bought the factory for a song. On the contrary, I have paid quite a high price. In those years, it was one of the most expensive privatizations, because Levon Ter-Petrosyan and his friends were doing their best to make sure I didn’t buy the factory. RH: Because I was one of Vazgen Manukyan’s supporters. They were persecuting and driving out all of Vazgen Manukyan’s supporters. They weren’t letting them live peacefully. I was simply kicked out of the country in 1994. SM: What does “I was simply kicked out of the country” mean? RH: I meant to say that if I didn’t leave they might kill me. There was an order to kill me. I left Armenia in 1994 and returned in 1995 to run for the Parliament. SM: Let’s get back to the privatization of Haytskhakhot. How did that happen? RH: Each enterprise of the association was privatized separately, and I became one of the shareholders of only one of them, the Yerevan factory, together with the staff, about 1,000 people. But it is true that we, Lida Sargsyan, Hrant Vardanyan and me, were the three largest shareholders. Each of us held 23.3% of the shares. That is, the three of us held the main package with 69.9%. I was still the Chief Engineer. SM: You establish Grand Tobacco in 1996. RH: I and Hrant Vardanyan, the two of us, established Grand Tobacco. We made important investments to achieve high quality in order to win the home market. SM: Why didn’t you keep Haytskhakhot trademark and established a new company? RH: At that time we had such a president of the republic (SM: Levon Ter-Petrosyan), who wouldn’t let us work. I have just told you that I had to leave the country in 1994. I have to say that when I returned to Armenia in 1995 and registered my candidacy for the Parliament, Gagik Jhangiryan cancelled my candidacy illegally a week before the election. That is how they prevented me from becoming a Deputy. This followed by the second stage of persecutions. Again, I had to leave the country. I returned at the beginning of the 1996 presidential campaign to struggle against Levon Ter-Petrosyan. This was followed by persecutions since September and arrests. I wasn’t the only one. A lot of people were like me. Those people are no longer in active. Most of them have left Armenia forever. I remember a guy named Rubo, who imported gas. He is still here. But the rest have left. There were two Rubos, they were friends, both were arrested, and so were many people like them. I remained in hiding until November 1996, until the time of the elections for Avan District Governor. I reappeared from underground on November 6. And on the 10th day of the month, the population of Avan arose against Levon Ter-Petrosyan and his pack, and I won in the election without any political orientation, without support from any political party. SM: Why did the people of Avan vote for you in 1996? RH: You should ask them. SM: Was it because you were a neighborhood tough guy (TN: թաղի տղա)? RH: Do you really think that my biography, which I related to you, is a biography of just a neighborhood tough guy? Is that all you concluded from all that. SM: But I don’t think that your activities were particularly related to the population of Avan. That is why I am asking. RH: People knew how much I had suffered. They knew that I was actively involved in the struggle against Levon Ter-Petrosyan’s administration. At that time, few had such courage. I was one of those who openly supported the opposition and stood by Vazgen Manukyan. SM: You are trying to say that your election as Avan District Governor was a result of people’s vote against Levon Ter-Petrosyan in 1996? RH: Yes, imagine that the entire state machine was working against me, but I won with 85% of the votes. At that time people voted not so much for me as against Levon Ter-Petrosyan. SM: It can be concluded from what you are saying that people back in 1996 had the opportunity to express their discontent by vote, which is no longer possible today. Don’t you think it’s a big difference? RH: No, it is not so. I do not agree with your evaluation, when you say that people hate the current administration. When people really hate the authorities, they stand up. No authorities can withstand hatred. I understand what you want to say. You mean the vote bribing, which diverts the course of the election. But you are mistaken. No bribe and no other means would help, if people really hated these authorities. It’s simply a group of people who use the new technologies, and the internet to send messages intended to plant the seeds of hatred against the authorities. I am not saying that everything is great about the current authorities. No, there are bad things. But it doesn’t mean that people hate them as much as they used to hate Levon Ter-Petrosyan. Be assured, there is no such a thing. And it is not good if the authorities are loved by everyone. That would lead to stagnation. Healthy opposition and healthy criticism are necessary. At any rate, people don’t feel that kind of hatred you are talking about. Yes, I admit that a part of the people do hate these authorities, but those who hate are not the majority. SM: All right. In 1996-1999, you were Avan District Governor and continued running Grand Tobacco. In 2005, you relinquished your shares. I have read that you were forced to do that. Is that so? RH: Where have you read it? SM: I don’t remember any more. What had really happened? RH: I sold my shares. SM: Even if you had decided not to work at that enterprise any longer, what was preventing you to remain one of its main shareholders? RH: In the Armenian reality… (SM: When I turned off the recorder for a moment, RH admitted that Robert Kocharyan had forced him to sell his Grand Tobacco shares). SM: When do you think you became an oligarch? RH: I have never become an oligarch and, by the way, I don’t even know what ‘oligarch’ means. SM: You are among the 5-10 families who are said to be the wealthiest in Armenia and hold the country in their hands. RH: I don’t understand what families I am supposed to be a part of. I am a member of my own family. SM: All right. Are you a millionaire or not? RH: Of course, I am. SM: In dollars or in euros. RH: I suppose in British pounds, as well. Listen to me carefully, only between 1996 and 2005, when Hrant Vardanyan and I were the owners of Grand Tobacco, the two of us paid $110 million in taxes. And I am not talking about my other businesses. If I paid so much tax, then judge for yourself how much profit I had… (Laughs). SM: What is more profitable: soccer or the other businesses? RH: (Laughs) I have no profit from soccer. It is charity. No one has profited from soccer in Armenia yet; neither me nor the other owners of the clubs. And this is how it is going to be in the next few years. But I hope that soccer will become profitable in the future. SM: Let’s talk about the restaurant-hotel in Avan. The newspapers wrote that it belonged to your family. What does that mean? RH: I had never announced it before, but it is registered under my father’s name. It does not mean that the restaurant is not mine. It belongs to my family, which does not mean that it does not belong to me, because my father’s property will eventually be transferred to me after he’s gone, and then to my son, after I am gone. SM: What other properties do the Hayrapetyans, namely, your father, own besides Harsnakar hotel-restaurant. RH: My father also has a farm near Abovyan, where cows and sheep are bred. They produce milk, cheese, sour cream and plain yoghurt at the farm. SM: And what does your father do with dairy? RH: How do I know? (Laughs) If you want to know the truth, 1993 is the last I was there. Can you imagine that should anything happen there they would, again, say that it was my fault. SM: Let us talk about the scandals related to you, starting with the situation with Bjni. You were blamed a lot for purchasing that company, which was taken away from the Sukiasyans, at an auction in 2008-2009. Were you forced to participate in the auction? RH: It is ridiculous to say that there was pressure. How can you talk about pressure, when I paid a very high price for that company? It was a commercial deal, which was going to result in more profits. SM: Didn’t you feel uncomfortable to purchase that company under such circumstances? SM: You know very well what circumstances I mean. RH: No, honestly, I don’t know. What circumstance are you talking about? SM: That company was taken away from the Sukiasyans. RH: How come? There was no such a thing. SM: You want to say that people were deprived of their property and persecuted, pressured, whereas since Kocharyan everyone is a saint. RH: Khachatur Sukiasyan was subject to tax penalty. SM: We all know how tax penalties are applied against people. SM: Do you think that tax penalty was justified? RH: Since I obtained that company, I researched that issue and I can tell you that the company had never worked in accordance with the law. If you compare the amount of taxes paid under Sukiasyan and during my ownership, you will be convinced, whereas I have achieved only 60% of Sukiasyan’s sales. I am even inviting you to Bjni factory to watch a video, which shows the condition of the factory under Sukiasyan and its current condition, and draw a comparison. You may even speak to the employees. SM: Have you kept the former employees. RH: All of them. A to Z. And I have modernized the factory in line with the highest European standards. SM: Hasn’t there been any staff reduction due to modernization? RH: No. Although I have equipped Bjni with the most recent technologies to make it an exemplary factory, however, I have not only abstained from making cuts, but also increased the number of employees to 380 with average salary of AMD 100,000 (200 euros). And 99% of the employees are locals, residents of Charentsavan. SM: Let us talk about the second scandalous story about to the removal of Ararat from the uniforms of Armenia’s national soccer team in 2009. RH: It was a mistake, a misunderstanding, the reason for which was the quick decision made without preliminary discussions. I had decided to have a ball on the logo. But I had not made inquiries as to where exactly the ball is going to be placed – at the top, at the bottom, or at the center of the logo. SM: And why did you decide to modify the logo? RH: I haven’t modified the logo. At that time, the logo of the National Soccer Federation was printed on the uniforms, whereas, according to law, the national team is supposed to have its own logo. That is to say, the issue was not about modifying the logo, but creating a new one. It was under these circumstances that we made that mistake, for which I apologize to everyone. I think that is the only mistake I have made in the soccer area. SM: So, wasn’t there a single person who would give you advice, a warning that you are making a mistake. Do you rule everything single-handedly? RH: Now listen, I have been silent up until now, but now I will speak up. It is true, I rule single-handedly whatever belongs to me, with all the responsibility associated with it. But I do take all the responsibility upon myself. And I always ask for an opinion about things that do not belong to me. That is what happened in regards to the logo. I turned to Tigran Torosyan, then the Speaker of the National Assembly, to get his opinion. I wanted to place the ball below the existing logo, but he advised me to place the ball in the middle of the logo. And when there was a debate about that issue, he was not man enough to announce how it had really happened. Yes, I had not said anything about this until now, but it was the former National Assembly Speaker who had advised to place the ball in the middle of the logo. I made a mistake and I admit to it. The opinion of the nation, the people, and the society regarding such general issues is very important for me. I repeat I had turned to Tigran Torosyan, the Speaker of the National Assembly, with respect to the logo issue. SM: But why him? How was he related to soccer? RH: It is the National Assembly that adopts laws. SM: You want to say that the logo of the national team uniforms is regulated by law? RH: The National Assembly has adopted the law on the national coat-of-arms. That is why I called the Speaker of the National Assembly and asked for advice whether I could place a ball below the existing logo, by the example of the Russian logo. He said he would call me back. He did call me back and said that I could put it in the middle. SM: Placing the ball in the middle meant removing the image of Ararat. Did he know that? RH: I can assure you that he did not know. Yes, I am saying that I have made a mistake. But it is not a fatal mistake; otherwise we should all go and hang ourselves from Ararat. SM: Don’t get me wrong, my concern is that there is a management issue. Any decision-maker, no matter what field of activity it is – economic, political or other – should have one or a few advisors who are capable of telling that person he/she is wrong. RH: See, I have purchased a new bus for the National team with colors matching the uniform and other peculiarities. They brought the bus, and I examined it carefully. But there was one thing that I wanted to remove because I didn’t like it. A.M. told me that I was right, and so did the Director of the Federation. I want to say that we discuss the issues. True, my nickname is ‘Nemets’ but I don’t act like Hitler. Any issue that is beyond my competence and professional activity is put up for discussion. SM: Let us talk about the “Three Oligarchs vs. Haykakan Zhamanak” case. Was it worth responding in such a way to the article published on October 14, 2010, even if we assume that the journalists had made mistakes? Don’t you think that demanding that a newspaper pay AMD 7.5 million, which is about 14,000 euros, was a disproportionate measure? RH: I don’t agree with you. Are you talking specifically about me? SM: The three of you. RH: Let us talk about me, if you don’t mind. SM: But you were together. SM: What does it mean to require enormous funds from a newspaper, while everyone knows the condition of the printed media? Explain your logic to me? RH: You are a journalist and a historian by profession. Right? Then let me answer you with a question? Very bad things are written about me. Do you believe that I sell drugs? SM: I don’t know. But my question was not about that. RH: Hold on a minute, am I involved in trafficking of women and drugs? I wrote to that person (JN: Nikol Pashinyan), asking him to publish a retraction, because it was all a lie. He refused by saying that the information was taken from another source. SM: Yes, it was from some Smbat Karakhanyan, Head of the Union of Russian Armenians. RH: Then he should have requested refutation from that person. I don’t know what that source had written. There is no such person in reality; he is their agent. There is no such a thing. About two months before that article that same newspaper had spread information that I had supposedly beaten up a policeman. I wrote to the paper that it was a lie and that they were simply compromising me and demanded that they publish a retraction. He refused. Then I went to court. I am honestly telling you all this. Judge for yourself. I sued the newspaper, demanding maximum compensation. But in court, the representative of the newspaper offered reconciliation. I said I would withdraw the charges if the newspaper agreed to publish a couple of lines of retraction on its first page. He agreed, and I terminated the proceedings. But Haykakan Zhamanak failed to abide by our agreement and did not publish a retraction. Not only did they refuse to publish a retraction, but also continued acting in the same spirit. Now you are aware of the two stories. That person (JN: Nikol Pashinyan) slings any possible and impossible mud at me day and night. Tell me, please, what am I supposed to do? SM: Do you have proof regarding the first case? RH: I have all the court papers; I can show you. SM: You want to say that that after this precedent you decided to take severe measures against the newspaper, so that they learn a lesson? RH: Let me ask you a question. If you think that I should not have acted that way, what do you think I should have done? SM: Sue them as you did and demand 1 dram as a symbolic compensation. RH: They would pay that symbolic 1 dram and would resume doing the same thing all over again the next day. SM: Have you noticed any changes after the “Three Oligarchs vs. Haykakan Zhamanak” case? RH: Sure. They haven’t written any lie about me after that trial, although they resumed it recently (JN: he means after the Harsnakar case). SM: What did you do with the money you received? RH: I gave it to the Kharberd orphanage located near Yerevan. I doubled the amount, and they were able to build a boiler house. May there be some use from Nikol Pashinyan to this country, these people. Let me add something: it is different with your news outlet; the journalists respect the rules of professional ethics. RH: You guys don’t attack somebody’s personal life and don’t insult them without being punished. You can’t imagine what is going on here. Only because I am not on Levon’s side, all kinds of rumors are spread about me. Let me tell you one thing: I have always been disgusted by Levon Ter-Petrosyan and the others who write about me. Due to my friendship with Andranik Kocharyan (JN: former Deputy Minister of Defense, member of March 1 fact-finding group and, until recently, a member of the administration of the Armenian National Congress), I have helped them in many situations. For instance, when Nikol Pashinyan’s newspaper was shut down, I was giving him money for a year, so that he can keep his newspaper going, although I had never spoke about it. As far as Shogher Matevosyan is concerned, how would you explain taking Chopard earrings from one person and attacking another, following an order? Is it an honest thing to do? These people became my enemies when, in 2007-2008, I refused to support Levon Ter-Petrosyan and finance his campaign, something I would never do in any case. They tried to scare me, but I am not the type of person to be scared. Undoubtedly, that is why I am “guilty” and a “criminal”. And, beyond doubt, that is the reason why they feel they have a right to sling mud at me on their pages. And now they are imposing an innocent corpse on me without asking themselves whether it is fair. I neither was there, nor was I aware of it. Nothing. Why are they imposing the innocent corpse on me? SM: Very good, let us talk about Harsnakar. Many questions come to mind. First of all, were you there or not? RH: Of course, not. Right now I am repairing my house and live here with my family. RH: At the Soccer Academy, the hotel… because my house is being repaired (JN: The Soccer Academy is a couple of dozens of meters away). SM: That is, a few meters away from the crime scene? RH: A few meters, 10 meters, 100 meters. I wasn’t there. I wasn’t aware. SM: Have the police interrogated you after the incident? RH: Of course, I have been interrogated twice. SM: What was your status? Were you interrogated as a witness? What was your status? RH: I am not a witness. How could I be a witness if I was not there? SM: Which means you are neither a witness nor a suspect? Nothing? Then you will not have to appear in court during the trial? RH: I don’t know. I am not a judge. It is up to a judge to invite me to the court. How do I know? SM: You are saying you have been interrogated twice. Was it official or not? RH: Of course, it was official. SM: Do you mean to say that the protocols of your interrogations have been attached to the case? RH: I don’t have a bodyguard. They are not my bodyguards. SM: You don’t have bodyguards? SM: How come? It is impossible. RH: Why is it impossible? SM: Because everyone has a bodyguard. RH: Who do you know? SM: Maybe they should be called something other than a ‘bodyguard’? RH: I have friends who accompany me. My workers are with me. SM: Tell me the truth. RH: I am telling the truth. SM: So, they are your friends. RH: Yes, my close friends, relatives, workers. They are always with me. SM: If I understand it right, these people who accompany you are jobless, if they are constantly with you. Do they live on love and fresh air? RH: For instance, he… (JN: RH point at one of the four men sitting at a table nearby) makes $20-30,000 a month. How much will I have to pay to hire him as my bodyguard? How much? SM: In a word, you insist on having no bodyguards. RH: Of course, I don’t. I have workers who are always by my side. SM: And they have such income that they can afford being by your side the whole day long. RH: Of course. Don’t you believe me? Usually, I don’t lie, I tell the truth. And I am saying that I don’t have any bodyguards. RH: If my assistant accompanies me abroad, does it make him my bodyguard? RH: My dear, I am usually accompanied by two people: a girl and a boy. As many as two persons. SM: Let me tell you that it is strange that you are accompanied by 5 cars, transporting not your bodyguards but simply friends. RH: In France, a brother does not visit his brother without making prior arrangements. Is it right or wrong? Yes, people don’t visit each other without notification. But here I can take you to my father’s friend’s place; I can also take my wife along and go to have dinner at their place. You are right, there are no such things in your country. I cannot prove what I am saying. You have come from such a country, where people lead a different life-style. It is different here. I cannot sit and have a meal alone; I am being honest with you. I cannot sit at a table only with my wife and daughter. There should be at least 5-6 people by our side. SM: Fine, let us return to the Harsnakar case. It is said that the restaurant staff beat up the five military doctors, which casts doubt about the policy of the restaurant staff. How do you hire such people? RH: I am not the one hiring. SM: Then who is it? RH: At this moment, as I am speaking to you, we need 50 employees. We place ads, people respond, we invite them to an interview and make a selection. SM: Who conducts the interviews? SM: And who exactly conducts interviews for Harsnakar? SM: Who is the director? SM: Was it you or your father who hired him? SM: Based on what criteria did your father appoint him a director? Were there any criteria or was it based on family or friendly connections? SM: Family and friendly connections? SM: Did that tragic incident make you think about the quality of your workers and that they should be educated in their field of activity, starting from waiters. RH: In fact, yes. I wish the waiters were educated. I sent six waiters to Italy to get training for Harsnakar restaurant in Sevan at my own expense. But they fled, they didn’t return. SM: Do you mean that your efforts to educate your employees have so far been unsuccessful? Hasn’t there been any success at all? SM: Are you saying that if you offer your waiters to train abroad, they will refuse? RH: Yes, I am ready to pay for everything, but they refuse to study. I can say why. A waiter gets $100 of tips a day, and if he leaves for training, then he will lose that $100. But, at any rate, they don’t want to study. Understand this. Waiters are really a big trouble. SM: And what about your managers? RH: My managers are brilliant and educated. SM: How many of them are there? RH: Three. And all three of them hold university degrees. SM: It is said that a manager is involved in the June 17 case. RH: None of the managers are connected to this case. SM: So, only the waiters are involved? Are all of those fifteen people, who are said to have participated in the beating, waiters? RH: There weren’t fifteen people. SM: So, you want to say that only those six arrested people have done the beating; or seven people, since one of them has been released. RH: There weren’t seven of them at the beginning. There were three, and then it became six. SM: According to the plaintiffs’ attorney, seven people were arrested. Then one of them was released. SM: Why would he lie? RH: At first, three people were arrested, then one was released, and then four more were arrested. SM: All right, at any rate it’s a large number. How do you explain that at least six of your employees have acted that way? RH: It is a terrible, disgusting, monstrous thing that was carried out with monsters’ hands. It is inexplicable for me. SM: In any case, it is obvious that you have a serious issue of managing your employees. RH: Sure, sure. Who says there is no such problem? SM: But at the beginning you were deny any responsibility. RH: But I am not the manager. I am the owner. You are confusing everything. Listen to me, five days ago, an employee of Harsnakar in Sevan had left the workplace, took a ride on a powerboat, those that drag balloons, fell off of it, breaking his ribs. Is it my fault? He left his job, while he was supposed to do something else. And what was I supposed to do here in Yerevan? If that guy died, would they, again, claim that it was my fault? SM: Let us go back to the Harsnakar case. How did you learn about the incident on June 17? RH: The director gave me a call. The restaurant worked that day… there were wedding parties in two places. The manager stepped out of the wedding place, found out that there was a fight and gave me a call. SM: And were you at home? SM: And what did you do? RH: I cannot say more than this, because preliminary investigation is underway. SM: Did you at least go there at once? RH: Listen to me carefully. I am not going to add anything more, because it will be considered an attempt to interfere with the investigation. It should be taken into account that there is an issue of investigation confidentiality. SM: At any rate, you insist that you weren’t there. RH: In fact, I would beg God to be over there. There is only one thing I would ask of God that day: to be aware ahead of time about what was going to take place or to be there. Had I known ahead of time or been on the spot, no such thing would have happened. Had I known that there was a conflict over there, people misbehave, this wouldn’t have taken place. I would only ask God to know about it. RH: Those are tall tales. The most ridiculous thing is that I know those six people by heart and I know who picked the fight…. The driver, who had never fought in his life. And it is incomprehensible to me. Some funny things come to my mind… that he was bribed… There is no such thing. There can’t be such a thing. Such things would come to my mind. SM: That is to say, you were thinking that it was done to entrap you? RH: Yes, something like that… because the fight was picked by a person who had lived his whole life like a chicken… the driver, the driver alone. RH: The restaurant manager’s driver… the one in charge of delivery… The driver, who had never had a fight in his life. SM: do you think those six arrested people are the real offenders? RH: Let me decline to answer, because the investigation is still underway. As soon as the case goes to court, I am ready to have a detailed discussion on this case with you, as much as you please… with substantiations. Believe me, I have one son. I swear to my son, I was not aware… I am not saying it for the record… I can say that all of my phone calls have been examined. The Levonian MPs even demanded… The examination of my phone calls did not prove my being aware. That is why they have shut up and mind some other business. You saw that a day before yesterday, it was said that it is not against Ruben Hayrapetyan. People already openly announce. …They are encroaching on my home, my family. Say, I am guilty, I am bad, very bad. Why should my children be held responsible? (JN: implies the August 7 march, which stopped at his house in Avan). RH: You are already interrogating me. SM: Is there a party at the restaurant. RH: Of course not. It is shut down. SM: Did the restaurant shut down after the incident? SM: There was also a lot of talk about you leaving for Ukraine with Serzh Sargsyan two days after Avetyan’s death. Is that true or not? SM: So, you didn’t leave for Ukraine, as the rumor has it. SM: How about Serzh Sargsyan? RH: Serzh Sargsyan paid an official visit. I even cancelled all of my business trips, because I wasn’t coming out of the house. SM: By the way, have you gotten in touch with the family of the deceased. SM: The family of the deceased. RH: Why should I have done that? Let whoever is associated with his death contact them. How am I associated with that man’s death to get in touch with his family? Whoever has done it, let him get in touch with them. A few rascals have done it, so let them give an answer. SM: Have you exerted pressure on the investigative team to extend the time frame given to the plaintiffs’ attorneys for them to familiarize themselves with the criminal case. Initially, they were given only two-three days. RH: No. To be honest, I wasn’t even aware of that. You know, this is why I have relinquished my Deputy powers, so that they don’t find fault with me for exerting pressure on this and that person. SM: No, I meant in a good sense. RH: Honestly, I am not aware. SM: The Harsnakar case is reminiscent of the Aragast café case, which resulted in Poghos Poghosyan’s death on December 24-25, 2001. RH: Where is the similarity? They are completely dissimilar. SM: Why? Are you saying that back then bodyguards beat the victim, and now it is not the bodyguards? RH: No, I wouldn’t say such a thing. SM: Back then it was a matter of arrogance – “Hi, Rob” – and the person is beaten to death. This time, too, I interpreted it as another matter of arrogance, maybe… I don’t know… it was about attitude, position… That too, right? RH: You speak based on what you have heard, but, unlike you, I was present there. I was there on the day of the Aragast incident. I was sitting a couple of meters from Poghosyan, at the neighboring table. SM: Did you know him? RH: No. There were four of us sitting at the table next to his: me and journalist Satik Seyranyan. Everything happened before my eyes. I don’t want to talk about it or draw any parallels with the current case. I would just like to tell you that there is no similarity between these two cases. Both of them are monstrous. But their causes are completely different, and these two incidents are absolutely dissimilar. SM: Suppose these two cases have nothing in common, in any case, we have to take notice that two people have been brutally murdered for no reason within a range of ten years. Does it not attest to some kind of aberration? RH: Let me tell you that what has taken place is something terrible, unforgivable, which has caused to great pain and until now I don’t know what to do. I am not trying to justify myself before people. I can even say that today is the first time I speak to a journalist about this. I had been silent up until now, because a terrible had happened, which has been deliberately politicized and artificially linked to my personality to such an extent that I have been directly accused of murder, which is unacceptable, when it is done without investigating the case and finding out all the circumstances. There exists such a thing as “presumption of innocence”. A few rascals, lowly people have taken themselves for an investigator, a prosecutor, a judge and sentenced me within a day. Things like this were happening in the times of Stalin ort Hitler. A decision was made on the spot, and charges were pressed against a person. The investigation will come to an end, the National Assembly will resume its work; I have the right to deliver a speech on the very first day. Then will I speak and say everything. Yes, I think that a very bad thing has happened, that an impermissible deed has been done, that there is a group of people in our country who think that they are non-punishable. But I don’t belong to that group and don’t even want to belong. Thank God, our President does not tolerate impunity even for his close circle, I can assure you. It would be impossible for me to be talking to you right, had I been even slightly guilty. Had I the slightest guilt in that case, the President would have already arrested me. Be assured. You know what? They’re trying to sling mud at our country, but that is not so. I admit that there are bad things, but not impunity. Today, whoever is guilty gets punishment. Yes, there is bad atmosphere in this country, an atmosphere of inability to forgive each other, tolerate each other; but there is no impunity. There is no such thing. Be assured that the guilty will be held accountable. SM: Maybe that is what will happen this time. But how about before? RH: No. We can say that the guilty were punished before, as well. And that is how it will be in the future, too. As long as Serzh Sargsyan is the President of the republic, that is how it will be. SM: If we look at the events from a distance doesn’t it seem to you that the country has taken a different course since Kocharyan’s presidency? RH: I agree with you to a certain degree. There have been many injustices in the past fifteen years. But if we thoroughly examine the years of Serzh Sargsyan’s presidency, we will see that there is no impunity. SM: You mean Serzh Sargsyan is not continuing Robert Kocharyan’s work? RH: No. Serzh Sargsyan is continuing his own work. He will not let any member of his party go unpunished. I am certain about that, I guarantee and will eat my hat. (…) At this point, I turned off the recorder, and the conversation went on without recording; then we return to the Harsnakar case. RH said that when the parliament resumes its work, he will withdraw his Deputy powers until the end of the trial, after which he would relinquish them again. 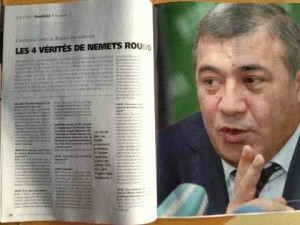 RH: They shout: “Nemets is murderer”. Why does he shout? …Is he an investigator or has he been there? …He has “witnessed” it… Why does he shout ‘murderer’? Who are they? Do they have a right to shout? I am a citizen of Armenia. I have a right to be defended, too, don’t I? Why do they shout ‘murderer’ to me? What if later on it turns out that I have nothing to do with all that stuff, if the investigation comes to that conclusion, what are they going to do? SM: At some point you said you had an impression that it has been an attempt to entrap you. Let’s assume that it was true. Who wanted to entrap you? RH: No, not the system. RH: Not even administration. Why administration and not authorities. SM: But why would it be done through you. RH: Because I have withstood…. I haven’t been a traitor. Try to see when the campaign of the wolf pack against me started, because they are a wolf pack. You call these news outlets oppositional, and I call them ‘wolf packs’. They arose against me following an order, when I refused to support Levon Ter-Petrosyan’s candidacy. SM: But you are not the only one who made such a decision. RH: Listen to me carefully, I am the only one. SM: I haven’t seen anything like that. RH: What are you saying? Do you think I am telling a lie? SM: I participated in the August 7 demonstration and did not see anything like that, except that we marched past your house. We stopped for a second and moved on. RH: And why did you stop? What is the fault of my son and my family members? Why did you stop in front of the Mayor’s house and scared five underage children? Is that correct? Is that honest? All right, I am bad, let’s say I am bad. What does my home have to do with it? Are you encroaching on my family? Are you going against my family? Has the Armenian nation turned into a worm? Has it been monsterized? How is it connected with my family? All right, I am bad, very bad. What is the children’s fault? What is the fault of the Mayor’s children? His eldest child is 13 years old. Let’s say the Mayor is bad. The eldest child is 13, while the youngest is two months old. What is the fault of these five children? Why? Is that democracy? Is that freedom, truth? They go yelling: “We have come to liberate Avan.” You have seen with your eyes who they were, how many they were. Do you think these people came on their own initiative? It is you, as a journalist, who went there out of professional interest. Why isn’t that snowball getting bigger? SM: That is a different story. SM: Do you know why? RH: Of course, I know, of course I do. RH: Why? Who are they? …Hired people. Do you really think that in this tiny Armenia I am the person who doesn’t know who communicates with whom. 45 days have passed since the incident; do you think I am one of those who doesn’t know who gives and gets orders? SM: Do you really think that the civil movements are coordinated from afar? RH: Do tell me, who is Garegin Chugaszyan? He is Robert Kocharyan’s puppy. Who is Hranush Kharatyan? Robert Kocharyan’s person. What are they supposed to do? They are supposed to weaken, disgrace and compromise the people who are loyal to Serzh Sargsyan, so that the Prosperous Armenia comes to power with Robert Kocharyan. To whom is it unclear? They are a wolf pack: the Prosperous Armenia, Levon, all of them have united… That is their struggle. It is not against me; they are trying to weaken Serzh Sargsyan. (JN: Garegin Chugaszyan and Hranush Kharatyan lead the initiative group of the Vahe Avetyan civil movement). If you want to come, you are welcome, come on. Let these people take a glance at the sixteen years of their biography. There are people… Why does he conceal the sixteen years of his biography? And that person is supposed to come to power? Who doesn’t understand what this is? SM: And how do you explain the “close relationship” between Levon Ter-Petrosyan and Robert Kocharyan? RH: How shall I explain? The only thing I know is that they want to destroy the country. That is not close relationship. They have united in order to destroy the country. Who doesn’t understand it? …Garegin Chugaszyan (JN: a barely audible word) uncovered their faces immediately… Who are the rest of the brats? … I know how much money they take and come over here. I know by heart who gives money, what they do. I know everything, each and every little thing, day by day. Through whom they take the money, everything… You may not know, but I am not the kind of person to have no access to such information. SM: For example, there is this young man, Davit Sanasaryan. (JN: Davit Sanasaryan leads “We Demand Punishment for Everyone Guilty of What Happened at Harsnakar”). Do I, as a citizen, have a right? RH: He has announced there is a threat of danger from Ruben Hayrapetyan… You, worm, would Ruben Hayrapetyan soil his hands by punishing you? RH: What right?… Of course, he doesn’t. RH: …have a right to accuse me of murder. RH: What does he do then? RH: And who told you that the investigation is unfair? SM: There are doubts about that. SM: I asked questions to the attorney regarding these doubts. I asked him to explain objectively the grounds for the doubts, and he explained it to me. He said quite logical things. RH: Listen, listen, listen… What are you saying? Maybe you have recently (JN: spoken) to the attorney… Two days later… the same day… What does Davit know to shout ‘murderer’. How Does Davit know that I am a murderer, when he shouts ‘murderer’. SM: I have Davit’s interview. He says: “I am not concerned about that person. I am interested in the fairness of the investigation”. RH: Very good. He is quite right. Who says no? Then let them go to the Prosecutor’s Office, stand in front of the investigator and shout: “We demand justice!” What does my house have to do with it? RH: Yes, I may also join them, go and shout: “Justice!” Is it normal? But what’s the connection?… that you pass a verdict on a man. You accuse him of a crime. That is what I am saying. I am not saying he doesn’t have a right. Who says he doesn’t? SM: I personally salute the existence of those guys. SM: You keep talking about punishing. Why don’t you call a press conference and say what you want to say? RH: Let me answer you. They accused me of murder from the very first day. Whatever I would say would be regarded as pressure against preliminary investigation. RH: I will keep silent until the case goes to court. After that I will be able to talk about everything and in detail. I will begin speaking as soon as preliminary investigation is over, because if I try to speak right now, they will say that I am trying to give directions to the investigation. SM: Would you agree if we said it in one sentence, in Levonian vocabulary, that this incident is a manifestation peculiar to a criminal administration. RH: No, I don’t agree. SM: You mean this is a regular tragic incident? RH: No. This is the consequence of cynicism, shamelessness and ugly attitude. What does it have to do with the administration or the authorities? SM: Do you want to say that it is not the authorities that are at fault, but rather it is Armenia’s society that is ignorant? RH: Yes, the society is ignorant. This is where the recording ended, but not our conversation, which went on after turning the recorder off and during which RH said some interesting things. I was able to take a quick note of the important parts. RH told me that he did not understand what had happened, because two or three of those arrested were not supposed to be there. They were not where they should have been, and RH doesn’t understand what business they had over there. Besides, he made me hear once again that the staff would never resort to violence, had the customers refrained from provoking them, thus insinuating that everything had erupted from the military doctors’ conduct. Then he began talking about customers’ conduct in general, which makes the work difficult. He told me that every person who works at the hotel and the restaurant principally tries to avoid having problems and fights. Thus, whatever happened was not supposed to have happened, and that he found it completely incomprehensible how it had happened. “Levon, you have introduced impunity to this country,” he said. “For twenty years, we have lived in a very bad system and we want everything to change at once. But we have learnt everything from them” (JN: from Levon Ter-Petrosyan and the Party of the Armenian National Movement). He explained that Levon Ter-Petrosyan was the one who got in touch with him, first in 2005 and then on August 21, 2007, and that Levon Ter-Petrosyan has personally paid him a visit twice at Harsnakar hotel in Sevan with the purpose of talking RH into supporting him in his 2007-2008 presidential campaign. Later on, again, he has tried to persuade him thanks to Davit Matevosyan. RH told me that at the very beginning of the National Assembly’s session, on September 10, he will exercise his right of speech and will withdraw his resignation. He said he would remain a Deputy until the end of the trial, and only after that he would resign. Kocharyan is his nightmare. RH again referred to the sale of his share of Grand Tobacco in 2005 and admits that it was Kocharyan who forced him to do so. Also, he reminded me that he was arrested in 2001 (but we did not develop that topic). He sees Robert Kocharyan’s shadow behind the alliance between the Prosperous Armenia Party and Levon Ter-Petrosyan. He admitted that he used to be a ‘naughty’, ‘aggressive’ boy, but denied having been a gang member (TN: գողական), a criminal, a bad boy. He refuted the story I had heard about him having knifed someone and served time in prison. He refuted that, but, at the same time, admitted to having been taken to the police station a few times but walked away without a trial. RH expressed philosophical thoughts about people like him becoming the victims of their environment, which compromised their authority. “We are the captives of our own environment.” To show an example, he recalled his father’s uncle’s grandson, who repeatedly took advantage of their blood relationship by displaying unacceptable conduct, ordering very expensive food and failing to pay the bill. He remembered having received a call from the director of Bellagio, after his father’s uncle’s grandson had been unable to make a payment, and he had to pay his bill. Now RH has erased that person and his mother from his life. By the way, that person is now in prison, and RH had done his best to make sure he received maximum punishment for his latest offence. RH said that the authorities and the administration should not be blamed for everything. He said that twenty years of independence is a very short period of time, and it will take time for Armenia to change. He said that the Avan Soccer Academy and the soccer fields located behind Harsnakar hotel-restaurant were constructed on his land and, by doing so, he has effectively donated 15 hectares of land to the Mayor’s Office.